Regardless of what else they might have bought it for, most people do some word processing on their Atari ST. It may even be (as it is in my case) that word processing is their No. 1 application—used more than anything else. This should not be a surprise to anyone, because, from writing lengthy manuals to sending a letter to a family member, the ST is a superior word processing tool. The crystal-clear monochrome screen or 80-column color screen, the large memory space and the GEM operating system all combine to provide the potential for powerful and easy-to-use word processing. Of course, the ST by itself won't process words; it takes software. By my last count, there were six word-processing packages still actively on the market. These range from relatively simple packages with a few features (but still enough to get a variety of tasks done) to an amazingly powerful program with a 600-page manual and a price to match! One of the packages (WordPerfect) has been plagued with bugs, while another (WordUp) is new to the market but appears to be quite solid. The rest of the packages—Regent Word 2, Word Writer, ST Writer and 1st Word Plus have been around for quite a while and have had several revisions. The purpose of this article is to take a look at each package, its features, shortcomings and unique points. Regent Word 2 is a simple, GEM-based word processor. It uses a single full-screen window, which is not resizable. Only a single document can be open at any one time, although you can use the Cut-and-Paste function to move blocks of text between different documents. Commands are available from the drop-down menus or from function keys, although there is no on-screen reminder of what the function keys are used for. Accessing the Help function brings up a dialog box which shows the function-key assignments and menu-key equivalents. Standard text styles (bold, underline, italics, etc.) are available from the menu, and these styles are shown on the screen. The screen-scroll speed is fast, although you can type ahead of the screen rather easily. These keystrokes are not lost, however, and the program catches up with you eventually. 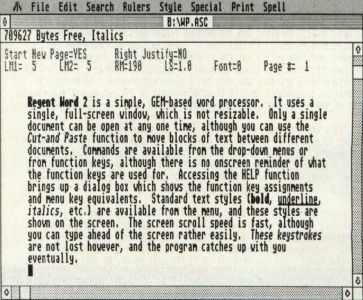 This was the first GEM-based word processor that automatically reformatted text as you typed, not requiring you to press a special key to rearrange text when inserting new material into existing work. It was also the first to do reliable double column printing (newspaper-style columns). Headers and footers are available, as is the ability to change formats (margins, spacing, justification, etc.) by inserting a new "ruler" at any point in the text. Printer installation is as simple as clicking on a selection in a dialog box, and a wide range of printers are supported. Files can be saved in ASCII format, but an automatic backup of the file you are working on is not created when you save a new version of the file. Block operations are somewhat clumsy. Selecting a block requires moving the cursor to the beginning and end of the block, each time making a menu selection or pressing a function key. You cannot select a block with the mouse (click and drag). Further, the selected block is not marked in any way. Once a block is defined, an alert box asks you what you want to do with it, and the choices are not as wide as with some other word processors, although adequate for most uses. Regent Word 2 includes a simple calculator (available from the menu), as well as word counter and spell checker. The spell checker can be run from within the word processor, but does not support "correct as you type" checking, nor is there a personal dictionary. You can, however, add words to the main dictionary. The trade-off for these shortcomings is speed, and many people swear by ST Writer because it is so fast. It can also do double column printing, headers and footers and supports normal find, replace and block operations (cut, paste, copy). Blocks can only be marked using keystrokes (makes sense), but marked blocks do show up differently on the screen. It also automatically reformats text very quickly as you type. 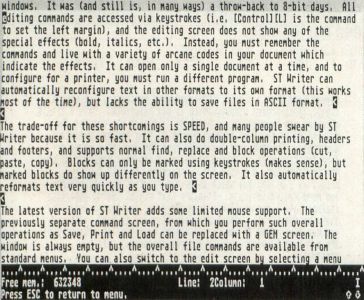 The latest version of ST Writer adds some limited mouse support. The previously separate command screen, from which you perform such operations as save, print and load can be replaced with a GEM screen. The window is always empty, but the overall file commands are available from standard menus. You can also switch to the edit screen by selecting a menu item. Further, desk accessories are available under the Desk menu of the GEM command screen. On the edit screen, the normal cursor is a text cursor, manipulated using the arrow keys. However, you can switch to the mouse cursor, which serves only to allow you to relocate the text cursor over large distances without having to use the arrow keys. Word Writer is a relatively powerful, GEM-based word processor. It has multiple resizable windows and can open up to four documents at once in separate windows. Most commands are available from drop-down menus, and many have "quick key" equivalents (press the key combination instead of using the menu). These quick keys are shown in the menus themselves, which makes learning them very easy. Commands are also available by pressing the function keys, and a reminder of the function-key assignments is shown on-screen. Standard styles of text (bold, underline, italics) can be selected from onscreen buttons or keys, but not from the menus. The different styles are shown on-screen. The currently selected style is indicated by letters in the upper left corner of the screen. When adding text to existing work, you must manually reformat by pressing a key, and switching to a different line spacing requires reformatting the entire document. Word Writer supports headers, footers and page-layout functions, although the margins can be set only for the document as a whole. Also supported are search and replace as well as standard block operations. You can select a block from the menu, function keys or by clicking and dragging the mouse. Only whole lines (not portions of lines) can be selected using the mouse. The printer selection can be changed at any time from a menu option. Printing requires saving a file to disk (which can be a problem with a large file), but printing then becomes a background tas—that is, you can continue editing your document (or even another document) while you are printing. Word Writer can save ASCII files, and there is a public domain program available which can convert ASCII files to Word Writer format. Word Writer also includes a substantial thesaurus and spell checker. The spell checker can check either the entire document or can continously check as you type. When a word is encountered that is not recognized, you can add it to a personal dictionary and multiple personal dictionaries are supported. A limited outlining function is also provided. The file generated is a normal one, but when using the outliner, automatic indenting based on outline level is provided, and special functions for editing levels (up a level, move a level, etc.) are available. 1st Word Plus is an upgraded version of 1st Word, which many people received free when they purchased their ST. It is a GEM-based program with multiple resizable windows and the ability to open four documents at once. All control is from drop-down menus and the function keys, with a reminder of the function-key functions being present on the screen, much as with Word Writer. A special window can be made visible on the screen, from which you can use the mouse to select characters which are supported by your printer but which don't appear on a keyboard key. European language letters and other special characters are available this way! Standard styles of text (bold, underline, italics) can be selected from the menus, and the different styles are shown on-screen. However, it requires an extra operation to restyle text which is already on the screen, whereas with most other word processors, this is automatic when a block is highlighted. When adding text to existing work, you must manually reformat by pressing a key. Files are automatically backed up when a new version is saved. 1st Word Plus supports headers, footers and page-layout functions. You can add a new ruler at any point in the text, allowing you to change the format of subsequent text: margins, tab stops and character size are all variable by using the ruler. Characters size can be set to pica, elite, condensed and expanded. There is a special graphics mode which shows the characters in their approximate size. You can also import .IMG picture files and resize or crop them right in the document. Imported pictures are only visible in graphics mode. A snapshot accessory is included to make taking screen shots for use in a 1st Word Plus document easy. Also supported are search and replace as well as standard block operations. You can select a block from the menu, function keys or by clicking and dragging the mouse. Only whole lines (not portions of lines) can be selected using the mouse. You may also save a block to disk. Printing requires saving the file to disk—which then closes the file. The file cannot be printed if it is open on the screen. 1st Word Plus handles ASCII files by use of mode: if it is in WP mode, it uses files compatible (except for graphics) with Word Writer. If WP mode is off, files can be loaded and saved in ASCII format. You can also save just the specified format of a document. If you then open a document with the same extender as the format file, this format will automatically be used initially. 1st Word Plus allows you to set marks in the text and then return to that mark with a menu selection, making it easy to find a particular place in the text. Also available are word count, automatic hyphenation and a spell checker. The spell checker allows both continuous and whole-document spell checking. No personal dictionaries are used, but you can add words to the main dictionary. Footnotes are supported, and you can add text for a footnote in its own window. Included is a utility called 1st Mail, which allows merging of text and data to produce form letters. 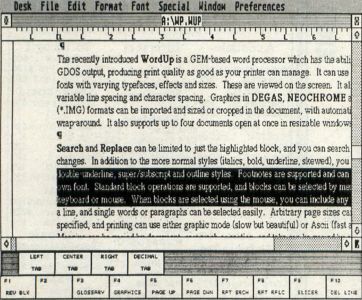 The recently introduced WordUp is a GEM-based word processor which has the ability to use GDOS output, producing print quality as good as your printer can manage. It can use multiple fonts with varying typefaces, effects and sizes. These are viewed on the screen. It also allows variable line spacing and character spacing. Graphics in DEGAS, Neochrome and GEM (.IMG) formats can be imported and sized or cropped in the document, with automatic text wrap-around. It also supports up to four documents open at once in resizable windows. Search and replace can be limited to just the highlighted block, and you can search for style changes. In addition to the more normal styles (italics, bold, underline, skewed), you can use double-underline, super/subscript and outline styles. Footnotes are supported and can have their own font. Standard block operations are supported, and blocks can be selected by menu, keyboard or mouse. When blocks are selected using the mouse, you can include any portion of a line, and single words or paragraphs can be selected easily. Arbitrary page sizes can be specified, and printing can use either graphic mode (slow but beautiful) or ASCII (fast and crude). Margins can be varied by document, paragraph or section, and tabs can be varied by section. The File menu allows access to handy disk operations such as formatting, renaming and deleting files. Automatic backup files can be created when you save a new version, although this can be turned off. WordUp supports a glossary function, which allows you to define a block of text and associate it with a word. When the word is encountered in the text, it can then be expanded into the defined block—a very powerful feature Also available is an exceptional Mail Merge function. A master page feature lets you define items (such as headers, footers, graphics, borders, etc.) which you want to appear on each page. These items will then appear when the document is printed. New master pages can be inserted at any place in the document, making multiple-section formats possible. You can also put the time and date on a master page (or anywhere else) and even have them updated whenever you print the document. Easily the largest (with a 600-page manual!) 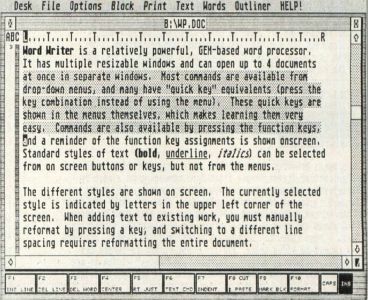 and most expensive of the word processors available for the ST, WordPerfect is the best-selling word processor in the IBM world. Ported to the ST and released too early, it was the subject of much user wrath as bug after bug surfaced. This was especially unfortunate, since the package is very expensive. However, WordPerfect Corporation and its team of programmers strove mightily and brought out several new versions, and by early May had a relatively clean word processor available. User updates and user support are free, a worthy policy in light, of the cost of the package and its problems. 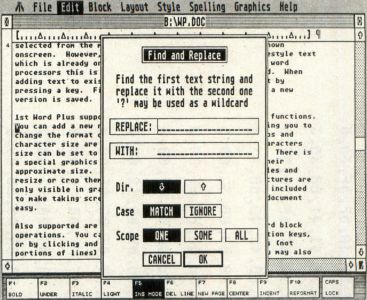 WordPerfect is a GEM-based word processor which has multiple resizable windows and can have four documents open at once. The huge number of commands are entered using combinations of menus, function keys (40 function-key commands) and keystrokes. The program is complex enough that a keyboard template is included. All the normal word-processing functions are supported, such as headers and footers, block operations, search and replace The block selection can be by mouse, menu or function key. A spell checker is provided, along with a huge thesaurus. Words can be added to the main spelling dictionary. There is currently no support for importing graphics. The program provides for outlining, paragraph numbering, widow and orphan control (keeps single lines from appearing on a page by themselves), and supports just about every printer ever made. Standard styles of text (bold, underline, italics, etc.) are shown on the screen when selected, although you can also open a window which shows the text in normal style and displays the formatting codes. These codes can be removed in the special window, although they cannot be added there, and the mouse cursor is turned off when this feature is active. Further, the "codes" window is not resizable and does not show very many lines of text. Footnotes, endnotes, headers and footers do not show up in the document on the screen, they only show up at print time Placing them exactly where you want them can require some trial-and-error printing. Beyond the normal word-processing functions are a whole wealth of "power functions," which normally would be used by people who do a lot of word processing. As mentioned above, footnotes and endnotes are supported, and can run multiple pages. Automatic hyphenation is also available. Automatic backups can be created when you save a new version of a file, but in addition, a backup can be saved on a periodic basis (this works best to a hard drive) so that a power failure doesn't wipe out all your work. Word-processing documents can include math functions. You can send a block of text to another file without loading that file first; the block is appended to the end of the other file. This is very useful for archiving portions of your work. You can also view portions of another file without actually loading the file, very handy for deciding what file to load! Two types of multiple columns are supported: newspaper-type (read top to bottom) and database-type (side by side). The mail-merge function can generate mailing labels. If you mark words as you go through your text, WordPerfect will generate an index of your document automatically, including the page number that the word is to be found on. It will also automatically generate a table of contents. The multiple levels of Undo let you back out of the last few changes you have made to your document. You can even design your own text cursor and mouse pointer to customize your version of WordPerfect. A unique and powerful function is the use of macros. A macro is a series of keystrokes which are activated by one key. For example, you could define macros which perform some of the more complex (in terms of keystrokes) commands WordPerfect is capable of. Or, if you don't like the keys that WordPerfect has used for commands, you can define your own. Thus, you can completely customize your copy of the program, as well as make your use of it more efficient. 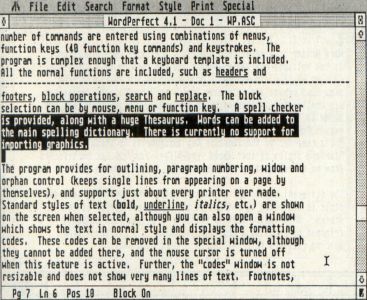 The macro function is especially useful in view of the fact that many of the WordPerfect commands require a lot of keystrokes (six or more in some cases). As with anything else, which package makes the most sense for you depends on personal taste and what you want to do with it. Word Writer is an excellent package both for short documents and relatively long manuscripts. It is fast, includes a spell checker and can open multiple documents. It is also GEM-based, so is easy to learn. 1st Word is somewhat clumsier in places, but allows importing graphics. WordUp is not as fast as Word Writer, but the multiple faces/point sizes and ability to import graphics makes it ideal for writing which must include pictures. Be prepared for the very slow output. If raw speed is your only concern, ST Writer can't be beat. It is very fast and supports multiple-column output. If you insist on multiple columns (but only a single document open) in a GEM-based environment, Regent Word is the way to go. And if you must have every feature needed to write a book and don't mind making a commitment both in time and money to your word-processing package, then WordPerfect may be the package for you. None of the packages discussed above could be called true desktop-publishing packages. WordUp comes the closest, with its ability to handle graphics and multiple faces and points. Desktop-publishing packages handle these features, as well as being able to do page layout: flow text in multiple columns over multiple pages, import and modify graphics, add simple graphics to a page, and make modifications to imported text (and generate original text when necessary). Desktop-publishing packages are usually able to import text in a variety of formats, which makes it generally more efficient to do the bulk of your text work using a word processor (which has more powerful text-handling capabilities), then impoit that texi into a desktop-publishing package.